Archial Group is one of the UK’s largest architectural practices, operating from 26 offices worldwide, including Glasgow, Edinburgh, Aberdeen, Dundee & Inverness. Its operating businesses include Archial Architects, Alsop – the pioneering architectural firm headed up by Will Alsop – and Sparch. Archial works in Europe, the Middle East, Asia and North America. It delivers solutions in both public and private sectors: commercial, corporate, education, health, leisure, nuclear, residential, retail and transport. Its education portfolio includes The Blizard Building (Queen Mary University of London), The Sharpe Centre for Design (Ontario College of Art and Design, Toronto). Archial has worked with 16 Scottish colleges, responsible 6 new campuses including South Lanarkshire, Langside and Clydebank. Atkins is a multi-national engineering and design consultancy, the UK’s largest multidisciplinary consultancy and second largest architecture firm. Building magazine’s Engineering Consultant of the Year, in the last year the company was named among the Sunday Times’ “20 Best Big Companies to Work For” and The Times “Top 100 Graduate Employers” and “Top 50 Companies Where Women Want to Work”. With around 600 staff in Scotland, Atkins employs a wide range of professionals – architects, engineers, surveyors and cost/project managers, and specialists in ICT, telecoms, transportation, power, geotechnology, planning and environment. With this breadth and depth of skills, these experts are frequently involved in high profile, complex and technologically advanced projects, not just in Scotland but across the UK and the world. BDP is the largest interdisciplinary practice in Europe, employing more than 1,200 architects, designers, engineers, urbanists, sustainability experts, lighting designers and acoustics specialists in 15 studios across the UK, France, Ireland and Netherlands. They work closely with users, clients and the community to create special places for learning, living, working, shopping and culture across Europe, Africa, Asia and Australia. They have a leading track record in health, education, workplace, retail, urbanism, heritage, housing, transport and leisure. BDP’s education design teams are leaders in their sectors, working to produce inspiring learning environments. Their interdisciplinary approach aims to:ensure buildings are student focused; use multi-function design to give greater value to clients and enable learning spaces to attract future students. Hopkins Architects and Bennetts Associates are leading architectural firms, responsible for prestigious educational buildings internationally. Hopkins’ portfolio includes iconic buildings: the Mound Stand at Lord’s Cricket Ground, Glyndebourne Opera House and, now on site, the 2012 Olympics Velodrome. Scots born Rab Bennetts has had an Edinburgh office since 1993, producing high profile buildings like the Informatics Forum at Edinburgh University (Best Building in Scotland 2008), Loch Lomond Visitor Centre and HQs for BT and John Menzies at Edinburgh Park. Bennetts is perhaps best known for the Royal Shakespeare Theatre at Stratford-Upon-Avon. Both firms have sustainability at the heart of their practice: Bennetts is on the Green Building Council board, developing policy for the UK. Hopkins was named Sustainable Architect of the Year 2008. RMJM is a Scottish-based international firm of architects with offices throughout the UK, Asia, the Middle East and the US. It is one of the world’s largest architectural practices, employing 1,200 people in 14 international offices. RMJM is collaborating with one of the world’s foremost architects, Frank Gehry, to bid for the design of the New Campus Glasgow project. Gehry is personally and directly involved in the design of all projects undertaken by Gehry Partners, LLP. The RMJM/Gehry team, which will aim to propose a building of global significance, will utilise RMJM’s Glasgow Studio, Gehry Partners’ Los Angeles Studio and RMJM’s Global Education Studio in Princeton, New Jersey. New Campus Glasgow Ltd – the company set up to deliver one of Europe’s most ambitious development projects has issued the tender for the architect/design team for Glasgow’s new city centre learning quarter. The team will design one campus across 2 sites for the 50,000 learners and 2,000 staff of the 4 city centre colleges – Central, Metropolitan, Nautical and Stow. The integrated campus will be located at 2 sites: City Campus on Cathedral Street (currently home to Central and Metropolitan colleges) and Riverside Campus at Thistle Street (currently home to Nautical College). The team will be appointed in the Spring of 2009. The design period will continue until building work commences in 2011. To give a sense of scale, the Allan Glen’s building of Central College on Cathedral Street is around 7,500m2. The first building(s) to go up on that site will be around 6 times that size. Over the coming years there will be a carefully planned process of buying land, demolishing or selling off old buildings and developing new buildings in a phased way that means the colleges will be able to operate ‘business as usual’. 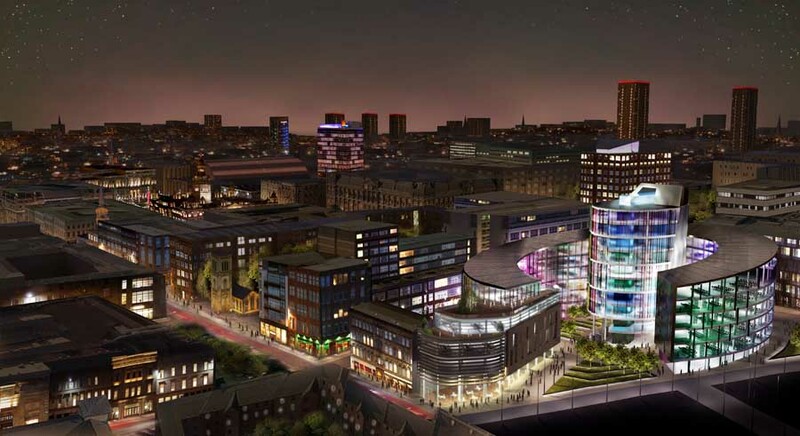 At this stage, the masterplan for the project is being finalised by Glasgow’s world renowned architects, BDP. This forms the brief for the architect/design team. Meantime, consultation is continuing with staff and students to ensure the new campus meets the needs of future learners, and the business case is being compiled to be presented to the Scottish Funding Council in March. – The four colleges are Central College Glasgow, Glasgow Metropolitan, Glasgow College of Nautical Studies and Stow College. 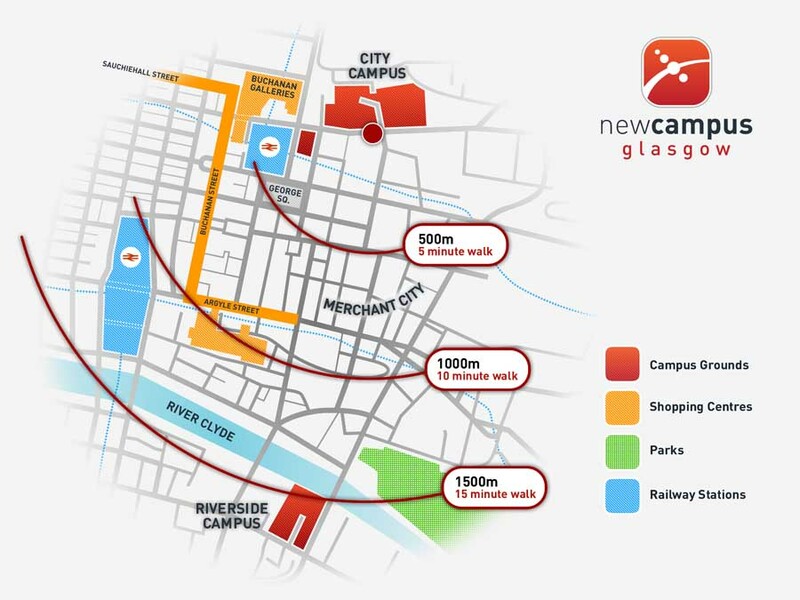 – New Campus Glasgow Ltd is a company limited by guarantee. The Company was established in May 2008 by the 4 colleges to advance the planning, procurement and delivery of a shared campus. – The project is headed by Project Sponsor, Donald Leitch who represents the 4 colleges, and Iain Marley, Project Director, with an experienced project team and a range of specialist consultants on legal, financial, cost, project management, and construction/design/maintenance. – The existing colleges’ estates consist of ageing buildings ranging from the 30s to the 70s across the city centre. – The new shared campus will continue to deliver the specialist courses aligned to Glasgow’s key industries: commerce, construction, creative industries – from graphic design to broadcasting, engineering, nautical, printing, and service industries – from tourism to hospitality and catering. – The Scottish Funding Council has committed to fund the project. The balance of funding will be raised by a mechanism in line with government guidelines.